"Warzone Collective began in 1984 when a few local musicians decided to pool their efforts, seize the time and get their own venue, practice rooms and social space. By 1986 the Collective opened its first premises in Belfast which provided a vegetarian cafe/drop in centre (Giros), practice and office space, venue and screen printing workshop. It developed organically along DiY lines and soon became a focal point for anarchists, punks, radicals, bohemians and other n’er-do-wells. In 1991 the Collective moved to a larger and more ambitious venue. 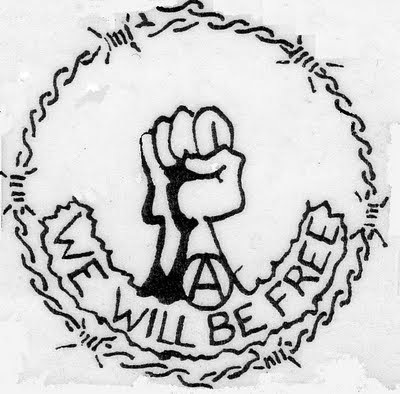 Over the years thousands of people passed through the doors and were exposed to new ideas such as anarchism and DiY politics and the Centre became the counter-cultural hub for the greater Belfast area and beyond. Towards the end of 2003 the Centre closed for a number of different reasons but it left a gap in radical Belfast culture. In 2007 discussions began and eventually in 2009 the Collective has reformed and is going through the process of trying to establish a new venue. Warzine is a DiY newsheet produced by the Warzone Collective periodically since the mid-1980′s. The newsheet is free and uncensored and offers news of what the collective are up to, reports on local struggle and international issues as well as personal opinion. Articles, rants and opinions as well as graphics are always welcome. Send contributions to warzonecollective@riseup.net and mark the subject box ‘warzine’. Annual festivities were recently resumed this year and hopefully Warzone Fest will be an ongoing event in the future. Warzone Gig Collective is now putting on regular gigs. To get in touch contact warzonegigcollective@gmail.com or visit the fb page."